We want your help to get the new ComicScene UK magazine into over 600 shops across the UK on a monthly basis. We need to raise £5000+ for the upfront cost to do this.ComicScene UK is a new magazine that features all aspects of comic culture. 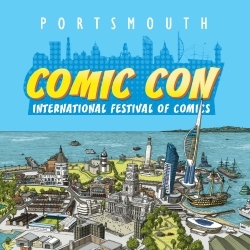 It was inspired by a wave of nostalgia for classic comics from the 70’s – when comics sold more than 1/4 million copies per week – as well as the eclectic, self-publishing dynamism of comics today and their massive influence on popular culture from TV & films, computer games and cosplay. The magazine also has a social purpose, aiming for some of the profits to provide free comic workshops for young people, helping to inspire the comic creators of tomorrow. The title also encourages improving literacy by comic reading for young children and young adults as well as identifying a variety of different comic genres to explore. The magazine is A4 64+ full colour pages using top specialist writers and creators, published by Tony Foster of comicsflix.org and designed by the Burgh Agency based in Edinburgh. The title is supported by the use of social media and additional website material. The intention was to follow a subscription only model but buyers from specialist comic shops across the UK agreed to sell them earlier than expected. A distributor has agreed to offer the magazine to all specialist comic shops. The magazine now needs your support to get into shops like WH Smith and make it more accessible to people, share information on classic and new comics and increase our potential profits for funding comic workshops. Newsagents are interested but there is a fee for this and your help will meet this cost.